Gameloft’s attempt at bringing tennis to the iPad’s big screen is a bit like watching the John McEnroe of old play a match: a frustrating series of brilliant hits and puzzling misses, punctuated by the occasional urge to throw your iPad on the floor and jump on it with both feet. No one can say Real Tennis HD is boring, however. Real Tennis looks real pretty, but the controls are real clumsy. Graphically, the game’s 3-D graphics feature smooth play and a reasonable level of detail, though a lack of attention to some areas, like lighting, make Real Tennis HD feel like a Playstation 2 game from the early 2000s (with the exception of player animation, which seems to have been taken straight out of a Super Nintendo title). The audio, on the other hand, is quite pleasant and well designed—the music that accompanies the game’s pleasant-looking menus is of professional quality and the crowd reactions are well timed and believable (unlike the crowd itself, which features no animation, thus making you feel like you’re playing in front of a sea of cutouts). This game’s real downfall, however, are its controls. I’m not sure how, but Gameloft’s developers have managed to make a virtual gamepad that always moves the player in the direction opposite to the one I want to go, and then coupled it with a system that requires you to tilt the device to determine where your ball will land—all this, remember, while you desperately try to use the gamepad to move and hit at the same time. Sounds confusing? It is—and how. As a result of these design decisions, it takes a remarkably long time to master the game, even at the most basic levels: be prepared to spend a good amount of time getting through the tutorial while you figure out how to slice the ball for effect (something apparently so complicated that the game makers give you the option to skip it). 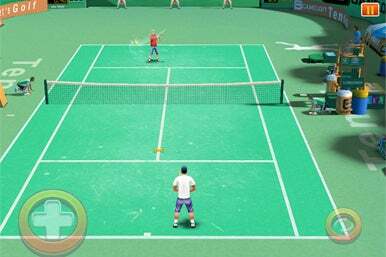 In the final analysis, Real Tennis HD is a valiant attempt at doing too much without focusing on the few basic elements that really make or break a game. The title’s problematic control mechanism overshadows what could have otherwise been a good tennis simulator, even if it doesn’t feature real players or courts, likely due to licensing issues.